You may notice the other member names are not fully displayed. This is because you haven't been accepted as a member of the community yet, so we truncate member names for privacy. Once you have been approved, you'll be able to view full member names. Although most admins approve members within 48 hours or so, sometimes that can take a bit longer in some busier communities, over the weekend, or during a holiday. If you've been pending for more than a few days you can get in touch with your community's admin. 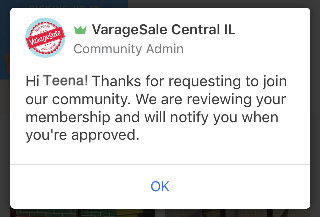 You'll also see your status on your community list and and at the top of the community page. While pending you'll see a banner at the top of the page letting you know.